Disclaimer: The views and opinions expressed in this article are those of the author and do not necessarily reflect the official policy or position of Trilogy Excursions. The dates are set, vacation time granted, tickets purchased and as the days get crossed off the calendar the dream is becoming a reality: You are going to Hawaii! Just when you thought all the hard work of saving and coordinating was coming to a close the most mysterious of all tasks rears its ugly head. You need to pack. Maui has a lot to offer from a 10K+ foot volcano to excellent surf, luxury hotel accommodations to barefoot bars, desert dry heat to monsoon rain squalls, zip line adventures to SUP and naturally you want to see and do it all. Unless you enjoy paying hefty bag fees and lugging around carry-ons as you sprint to catch your connecting flight, you need to pack smart. As someone who used to vacation on Maui and has now made the transition to living here, I would like to share some tips and tricks on packing wisely for your Maui vacation. Below is a list of things to leave at home, what to mash into a suitcase and what to snag here. Let yourself fall in love with Maui's slower pace and laid back attitude. One of the best ways to experience a new place is to live like the locals, and you won't catch one wearing a suit and tie. Even the finest of restaurants on Maui need nothing more than a snappy Hawaiian shirt and slippahs (when in Hawaii, flip flops are affectionately referred to as slippahs). The weather in Maui is fantastic day after day. If it is raining, you can sit it out or seek sunshine on another part of the island. Humidity and trade winds are not conducive to perfectly coiffed, non-flyaway hair. Embrace beach hair and leave the straightener at home as it is a futile effort. Free the curls and let those locks bounce, baby. Beach hair, don't care! 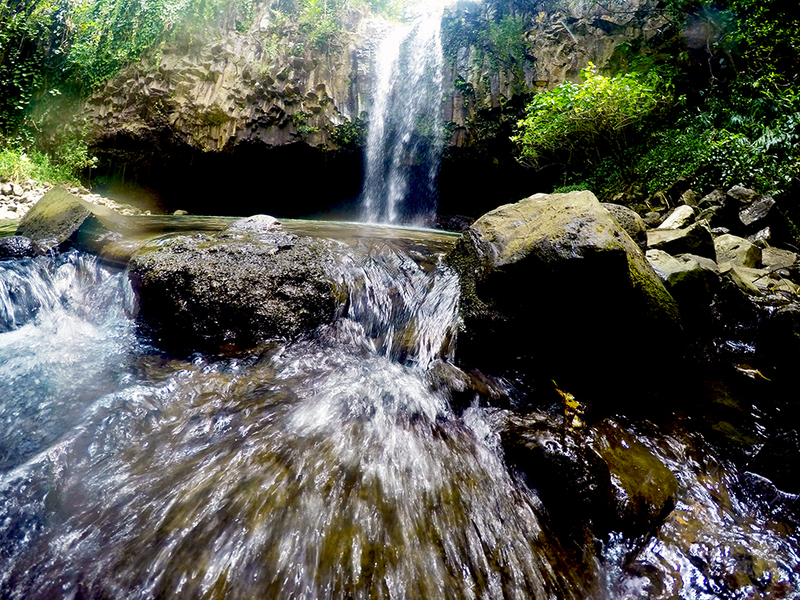 Illustrious waterfalls, bamboo forests, black and red sand beaches, and of course Haleakala are all on the to do list. Once you have traversed the 59 bridges and 620 curves of the Hana Highway (and back again), paid a visit to the 10,000 foot peak of Haleakala for sunrise, and hit Wailea for sunset cocktails you will thank me for this tip: Costco has the cheapest gas on island which saves me $10+ each time I fill up my little 14.5 gallon gas tank. Since Costco is centrally located in Kahului near the airport, chances are you will be passing by several times throughout your stay. With proper planning, you can take care of most of your fill ups here, including the pre-rental car return mad dash refuel. The lines can be long, but they move fairly quickly. A word to the wise: 7AM weekdays are the best time to fill up, Mondays between 5 and 6 are the worst. Maui Costco is not just great for gas! More on that later. Photo courtesy of Kate Middleton - When snorkeling with Trilogy Excursions, snorkel gear is provided, including wetsuit tops for colder weather. Bikini or board shorts – Don’t spend your first day on island shopping. Get outdoors and into the water! In all likelihood you will spend most of your time in these, so my recommendation is to bring at least two so you have a day in between to dry. Sunnys - It may be gray where you live right now, but it won't be on Maui. Bring your best all-around pair, but rest assured several convenience stores on island have stylish yet cheap glasses you won't mind losing. Reef Safe Sunscreen (or buy here) - I sincerely urge you to refer to our post regarding reef safe sunscreen. The concentration of visitors to Maui reefs is growing, and with that comes chemicals in sunscreens that kill our precious coral. In order to keep reefs flourishing and suitable for snorkeling, we need to do our part to protect the resources. While shopping, buy something stronger than your usual SPF. The sun is much more intense here than, say, Florida. Even when the temps are cooler, the sun is baking your skin and no one wants to be the red lobster at the party. Lip balm with SPF also comes in handy, keeping those lush plumpers from turning into cracking lizard skin. If you forget, Mana Foods in Paia has vanilla lip balm with SPF 15. Grab extra, as they make great gifts for folks at home. Beach cover ups - Gents, consider brandishing your guns, as tank tops are perfectly acceptable! Ladies always love the breezy freedom of cover ups. Since you might go straight from the beach out to lunch, women might consider packing a cover up that doubles as a dress. Hair and Skincare - Sunscreen and salty water are murder on your hair and skin. If you have long hair - consider bringing a shampoo that removes sea salt and sunscreen. My ponytail always soaks up the sunscreen from my shoulders and requires a little extra "oomph" to kick out the new hair hitchhikers. Aveda Sun Care Hair and Body Cleanser works well for my sensitive scalp. If your skin tends to be delicate like mine, come prepared with a facial cleanser and toner to remove impurities from your pores. Salt, sunscreen and sweat are the perfect cocktail for a pimple parade which will not have you looking your best for vacay photos. This is not the place to save space in the suitcase. Hiking trails abound in Maui, and rewards in the form of waterfalls, aerial views, tropical flowers and nene geese are well worth the effort. Microclimates make it entirely possible to encounter intense sun, pouring rain, thick humidity and gusting cold wind all in one day. How could you possibly prepare for all these changes? My biggest recommendation is moisture wicking clothing be it active, casual or semi-casual. Many times rain only lasts a few minutes and by the time you have your rain jacket out of your bag, the culprit cloud has already passed. On the other end of the spectrum, hiking can be hot, sticky and strenuous. You are going to want clothes that pull moisture off when you sweat and dry before you arrive at the blustery summit of Haleakala. Photos courtesy of Trilogy Excursions Ambassador Ben P.
Hiking boots? It is always a good idea to consult your doctor before partaking in physical activity and I am not a doctor. Based on my experience and abilities, there is no need for hiking boots when pursuing Haleakala, Twin Falls or any other trail on Maui. The benefit to this is more space and less weight in your suitcase. Should you decide to take a longer trek, my general rule of thumb is to switch to boots when the pack is over 30 lbs, as that is when you will need the leverage of a thick sole. If you are lucky like me, your gear just so happens to be super lightweight, keeping your pack below the 30 lbs threshold. Again, this is just my experience, not the advice of a physician. Chacos or Vibram FiveFingers - There are several stream crossings and waterfalls you may want to visit on your hikes. Slippahs are difficult to keep on your feet (though locals are pros) and full shoes tend to fill up with water and fall off or become a squeaky blister buffet. Chaco sandals provide enough straps to pass through streams and soles to protect your feet from unforeseen rocks. Vibram FiveFingers offer more proprioception, do not fall off, and also offer sole protection. Both companies offer models that grip wet surfaces better than competitors. Personally, I own both and tend to lean toward the barefoot experience, but several guides here on Maui also wear Chacos. Test them out before your trip so you know what works best for you. Thin wool shirt - Wool has come a long way. Super lightweight and packable, a long sleeve wool shirt might be the difference between a miserable hike and a comfortable one. Interestingly enough, wool pulls moisture off your skin while it is still vapor and before it turns into water droplets. That means you are likely to dry out faster and therefore stay warm and cozy. If you are anything like me, air-conditioning is nice sometimes, but mostly offers a bone chilling and body stiffening effect. Take that long sleeve with you in your bag day-to-day and you will be prepared for everything. Jacket - If you packed your layers, a lightweight shell will be enough to get you to the top of Haleakala. Your body will be warm from exertion and you won't want to spend a ton of time on top before returning, but a jacket will suffice. Should you plan on driving up for sunrise, on the other hand, better bring that down coat. Down coats usually have a stuff pocket making them easy and light to throw in a suitcase. Jeans - Upcountry can get quite cool at night compared to Lahaina or Wailuku during the day. You will want to pack at least one pair of jeans for dinner upcountry. Higher end restaurants like Mamma's Fish House do not have a dress code, though gents will feel more appropriate in jeans or pants for outings such as these. Shorts are widely acceptable and sometimes even board shorts. You will get the hang of what works where fairly quickly. In most instances, it is Maui and no one really pays attention for very long. Sun dress or maxi dress - Ladies look lovely in Maui and that is largely due to dress culture. Having lived on the east coast for fourteen years, I am utterly thrilled to wear a summery dress every day. No matter the occasion: cocktails, dinner, music event or even work, a dress is perfect and comfortable for any occasion. If you head upcountry and prefer not to wear jeans and a tank, here's your opportunity to throw on that maxi dress that has been neglected in the corner of your closet. Dress shoes and heels - case by case, both can be nice but never the norm and certainly not expected. Hawaiian Shirt - When it comes to dressing up for dinner at a highly acclaimed restaurant such as Mama's Fish House, women visiting Maui actually have it easy. There are multitudes of dress shops and boutiques to snag a dress with large Hawaiian floral prints. Men, on the other hand, need a Hawaiian shirt. When new at the game of Hawaiian shirt hunting, the choices can seem daunting. How does one choose a dapper Hawaiian shirt? Avoid the souvenir shop and head to a boutique. You need an expert on shirts, not dashboard hula dolls (But make sure to get the hula doll for your dashboard at home too!). A couple coveted brands: Reyn Spooner and Tori Richard. Sarong - The best Hawaiian prints are right here in Hawaii. As with Hawaiian shirts, make sure to go to a boutique where store associates can help you choose as well as demonstrate all the different ways to wear your new Hawaiian sarong. Once you have that knowledge, keep your nice new sarong for special occasions. Costco and various other souvenir shops offer many great additions to your beach wear wardrobe. Rash guard - An excellent way to reduce the amount of sunscreen you are slathering on your body, rash guards not only protect you whilst surfing, they also offer SPF. Though they do not take up much space in a suitcase, chances are you will have more options in places that are sunny year round. May we recommend the Trilogy rash guards sold on all Trilogy tours as well as in office? What are your favorite Maui vacation packing tips? Please share in the comments and we will look forward to hosting you soon!